Home » Blog » Roof vacuuming » Allergies » Why do rats love my home? Why do rats love my home? Did You Know: A rat can go longer than a camel without having a drink of water? They can do without water but not your home. Eco-smart Pest Control has seen ceiling cavities so bad it seems the rodents have been living in the home longer than the owners. Rats love you and your home because you supply them with exactly what they need. Your garbage is not disposed of correctly. You have weeds and shrubs growing in areas and not taking the necessary steps to remove them. Your ceiling is all cluttered up with dirt and dust. You have various water leaks around your home. So yes, these are all the elements which attract rats to your home. You need to take the necessary step in order to ensure that you are not opening an invitation to these rodents who can literally destroy your home and be harmful to you and your family’s health. The last thing you want is for your little ones to be rushed to the hospital not knowing what is wrong with them. The last thing you want is the germs and mites carried by these infectious rodents to spread to your new born baby or toddlers. Ask yourself, how do I get bed bugs, or dust mites in my home? 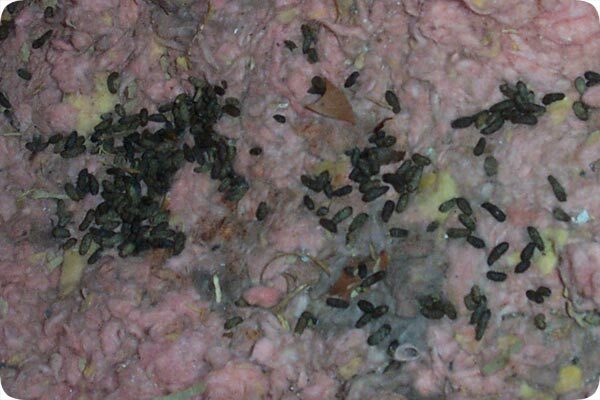 These mites could have been transported to your home via the rats and their fur. How do I stop them entering my home? Eco-Smart Pest Control cares about your family and your health. Eco-Smart Pest Control also treats the outside of your home with safe and secure pest control treatments. This helps prevent rodents from entering your home. We offer pest control for the following insects: ants, bed bugs, roof rats, Norway rats, mice, crickets, fleas, hornets, wasps, bees, cockroaches, fish moths (Silverfish), carpenter bees, flies, mosquitoes, rodents, bird lice and many other pests. Termite control for subterranean termites using pre-construction or post-construction methods (this comes with a 5 year guarantee) or lawn treatment for harvester termites. We do weed control (soil treatment), especially for the construction industry. We remove any dust, dirt and rubble from your ceiling cavity. We then vacuum the cavity and provide a FREE rodent treatment in the ceiling. Finally we spray and eco-friendly contact residual insecticide on all the surfaces to treat for (but not limited to) dust mites, bird lice, termites and cockroaches. Please feel free to contact Aaron on 076 509 4708 for an obligation free quotation.